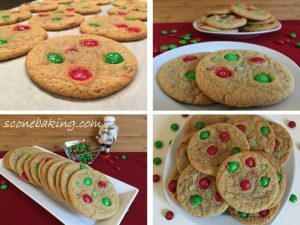 Here is the photo tutorial of my son’s favorite cookie at Christmas time (actually any time of the year), M&M Cookies. 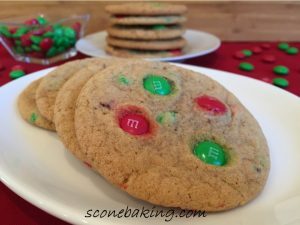 For my Christmas M&M Cookies I use the special red and green M&Ms to give them a holiday touch. 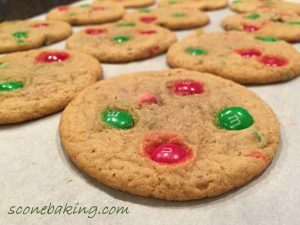 These cookies are filled with crunchy-chocolaty M&M’s and are quick and easy to make. 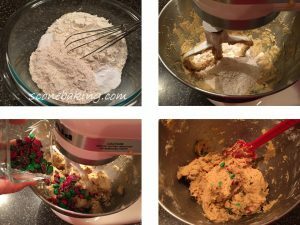 They’ll make a great addition to your Christmas cookie tray, and I’m sure they’ll become one of your family’s favorite Christmas cookies. 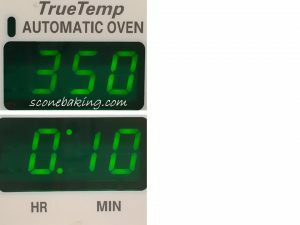 Preheat oven to 350ºF. In a large mixing bowl, cream together brown sugar and butter on medium speed until light and fluffy (about 3 minutes). Add eggs one at a time to sugar-butter mixture, until well blended; then blend in vanilla extract. In a medium bowl combine both flours, baking soda and salt. On slow speed, slowly add flour mixture to sugar-butter-egg mixture; once combine increase speed to medium until complete combined. 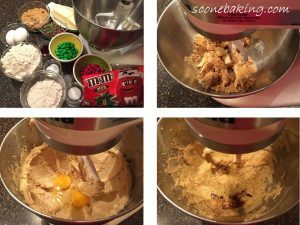 Add 1/2 cup chopped M&M candies; mixing until combined. 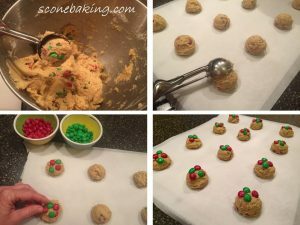 Drop on a parchment-lined baking sheet, using a #40 cookie scoop (disher), or 1-1/2 Tbsps. placing 2″ apart. 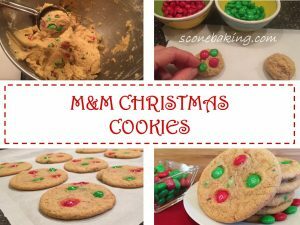 Press 4 (2 red/2 green) M&M’s on each cookie dough. Bake at 350ºF for 10-12 minutes, or until lightly golden brown. 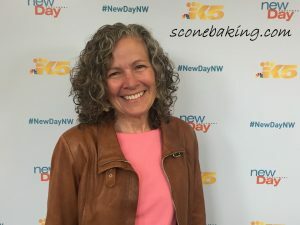 Remove cookies, with parchment, from baking sheet onto a cooling rack. Let cool completely.